What's silver and black, matches a GTX 980 for performance but costs less? Nvidia's new GTX 1060 graphics card, according to its maker, which has been officially unveiled to the world. The GTX 1060 is officially the third graphics card built on Nvidia's new 16nm Pascal architecture. Although it replaces the GTX 960, Nvidia claims the GTX 1060 delivers GTX 980-level performance. The 1060 also exists as a more affordable alternative to the enthusiast-grade GTX 1070 and GTX 1080 cards. Nvidia is targeting every gamer and their cat with it, while looking to strike a rival blow to AMD's Radeon RX 480. Available starting July 19, pricing for the Nvidia GTX 1060 starts at $249 (about £192, AU$331) while the Founders Edition comes at a higher $299 (about £230, AU$398) premium. The new GPU boasts 1,280 CUDA cores, a base clock speed of 1,506MHz (boosting to 1.7GHz), a 192-bit bus interface, 2000MHz memory speed, 129GB/s of memory bandwidth, a TDP of 120W (below the 980's TDP of 165W) and 6GB of GDDR5 memory (clocked at 8GBPS). There's also a 6-pin power connector, and connectivity options include three DisplayPort 1.4 ports, HDMI 2.0B and Dual-Link DVI. Nvidia has confirmed that the GTX 1060 will not support SLI. 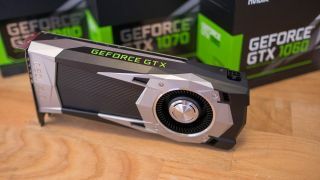 The company expects that the GTX 1070 will be the favored option by gamers who run multiple GPUs, so it's concentrating its SLI efforts on the more powerful card. Nvidia has highlighted number of VR-specific technologies supported by the GTX 1060 that fall under the company's VRworks suite of development tools. They include simultaneous multi-projection (or SMP), which is designed to make sound, physics and light appear more realistic in games. The Unity and Unreal Engine game engines support SMP, and more than 30 games that use it are currently being developed. They include Everest VR, the upcoming Unreal Tournament reboot, Obduction, Adr1ft, Poolnation JR and Raw Data. Nvidia is releasing a VR Fun House demo in July that's set to show off the results of its latest developer tools. Finally, Nvidia is readying a new piece of software called Ansel, which it describes as "Instagram for games". Using a free camera, Ansel lets you apply various filters to snap those all-important artsy shots in games such as The Witcher 3 and Mirror's Edge: Catalyst. You'll be able to try it for yourself from July.